Stone engraving machines for sale. Impact Etching is a revolutionary yet simple stone engraving technology purpose-built for Monument Companies. It is the most practical solution for engraving portraits and scenes on granite. Our machines are successfully used for headstone etching, pet memorials, memorial plaques and all other applications involving engraving on polished stone (granite, basalt, marble), or glass. Looking for the stone engraving machine ? If so, you probably came across offerings of laser etchers, so let us clarify one thing first: our machines are not lasers. Which, we believe, is GREAT! Because laser machines have a number of limitations that make them tricky to use in the monument trade. Unlike lasers, our machines hit the stone physically, with sharpened diamond tip. Simplicity is a major requirement for design of our etchers. Our equipment and software require minimal training, so that you can start realizing return on your investment right away! And, with our inexpensive Image Editing Service, you do not need to worry about preparing your image for etching. You can start creating etchings and paying off your investment from the day one ! Get all your questions answered and issues attended to on the day you contact us ! Machine support is provided by re-sellers located in North America / Canada. Our machines are covered by 2-year warranty. Create your etchings in-house, without relying on subcontractors. Our machines are ideal for smaller monument shops ! Unlike laser that evaporates a thin upper layer of the stone, our Impact Etchers hits the stone with a diamond-tipped needle, penetrating the surface much deeper. This results in bright, sparkling images created on stone. Impact etching is as close as its gets to manual etching done by the artist, with no associated labor costs. Our machines are being offered in US and Canada since 2009. During those 7 years, we installed our etchers at hundreds of monument shops. All those machines are still in use today. Most customers report “paying off” their equipment in 6 to 12 month. Check the “Testimonies” section of this web page for more details. Our machines are inexpensive considering their incredible reliability, 2-year warranty, and quality of etching. We put the power of Diamond Etching into the hands of smaller shops, so that they can reach positive Return on Investment in the matter of months. Please see “Profitability Analysis” section of this web page for more details. Laser is very sensitive to the quality of the stone. For laser-etched pictures to look well, you need expensive, perfectly black marble or granite. Our Diamond Etching machines, on the contrary, produce etchings that look great even on the colored stone. Our compact model, DiamondEdge-Sprinter™, is placed on top of the stone, so it can etch stones of any size. Sprinter model can also be positioned vertically. We take the hassle of image editing away from you by providing high-quality, low-cost, reliable image editing service. We will charge a flat fee of $20 to prepare your image for etching, so that you can be sure it looks great on stone. Interested in taking your monument business to the next level? Our Engraving machines are available for sale in Canada, US, UK, South Africa and Indonesia. More than 500 happy customers and counting! Purpose-built for stone engraving Ideal tool for small and medium monument shops! 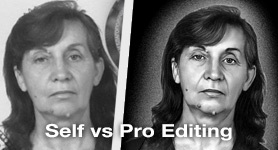 No stress with image editing! Send your images to us, we will prepare them! Customers love our Image Editing Service!